Another very little meter, it's only about 2-inches square and an inch thick. Meant to hang lightly (with a chain) around the neck or on a camera strap (if kept in its leather pouch). As you can see by the specs, I know next to nothing about this meter other than what's written on it. It's a little than my other meters in that it doesn't have a needle, it's a direct-read: you turn the outer dial to the film speed (calibrated in DIN only) and it has the shutter speeds. The inner dial spins, depending on the amount of light stiking the cell, and the f-stops are that inner dial so the combinations match up that way. Very cute idea. It's also marked for cine frame-rates. The front end of it has a hinged window with a heavy neutral-density filter, so you leave it in place for bright light, or flip it out of the way for dimmer conditions. One of the few older-meters that I have that still works; it probably spent most of its life in the leather pouch. No idea how much it's worth, but I see one place in the UK lists a "Fris Auto-Meter" for £69 (over $100 USD at the current exchange rate). I got mine as a lot with a couple of other meters for not about 1/10th of that (which means it's probably not the same meter at all). 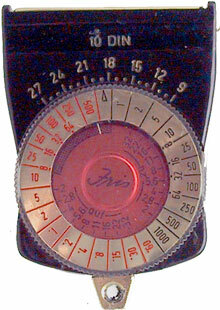 I subsequently found a German web page which lists this meter but doesn't tell me much more about it. VEB Gerätewerk Karl-Marx-Stadt appears to have made radios as well.